1st segment: Scot welcomed Fr. Mark back to the show. They discussed Fr. Mark’s plans for the weekend and Scot shared his plans. His family is beginning a new family tradition with a sleepover in his brother’s yard with all the kids. Scot’s not big on the idea of sleeping outside. Today’s guest, Fr. 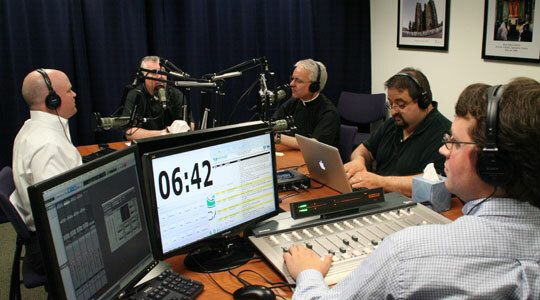 Jay Finelli, has a particular ministry, in addition to his parish work, working in podcasting and on the Internet. 2nd segment: Scot and Fr. Mark welcomed Fr. Jay to the show. Fr. Jay is based in Tiverton, Rhode Island, which borders the Diocese of Fall River and he knows Scot’s brother, Fr. Roger Landry in New Bedford. His parish is much closer to the Diocese of Fall River’s cathedral than his own Diocese of Providence’s cathedral. Fr. Jay was ordained in 1992. Before that, he went to Mass a child because his parents too him. He had friends who were involved in the charismatic renewal and when he got involved he started going to daily Mass. He started to think about becoming a deacon, then started to feel the tug of the priesthood. This was when he was about 18 years old. He waited about 3 years to begin the formal process of discernment. He’d gone into junior college and studying science, but then he decided to apply to the seminary in his diocese. At first they didn’t think he would do well at the diocesan seminary academically. He went to Holy Apostles Seminary in Cromwell Connecticut. He met Franciscans from Kennebunk, Maine, and joined them for 7 years. When the Iron Curtain fell, the order decided to move to Lithuania, which he didn’t want to do, so he left the community and went back to Providence, where he was incardinated. The Franciscans sent him to St. John Seminary and he graduated in 1991. He went to St. Matthew’s in Cranston, Rhode Island. It was a big change to go from a large house of men his age to a rectory with just a couple of priests. After a year, he went to St. Gregory the Great, in Warwick, then St. Kevin in Warwick, which had the largest parochial school in the diocese. From there he went to the largest Portuguese-speaking parish in the diocese, St. Francis Xavier. The people there were on fire. At daily Mass, the singing of the people would blow off the roof. He doesn’t know Portuguese, but he would read the prayers in Portuguese and he had a translator for the Gospel and his homily. In his current parish, there’s still a sizable contingent of people of Portuguese background. Holy Ghost in Tiverton was his first pastorate and he’s been there for 9 years. Scot asked him what it’s like to have been there for 9 years, to see half-generation of family development there. It’s awesome to baptize a child and then to give them First Communion a few years later. It gives him a new perspective. His first seminarian was 13 years old when Fr. Jay arrived and now he’s just graduated from Providence College and is heading to Rome for seminary. He considers him his first “son.” Scot asked what it’s like to have someone he mentored to choose to enter the seminary. Fr. Jay said priests look at parishes as their family. It’s moving to see how he’s come a long way. It’s powerful to see God’s graces working in a young man’s life. Fr. Mark said he was in seminary with Fr. Jay at the same time, with two years difference. He said the rector at the time used the same image when talking about being a priest. Don’t think your celibacy is without fruitfulness is what he used to say. Fr. Jay said the last ordination from that parish was 70 years ago. He believes that if you don’t give priests to the church, then you don’t deserve one and that’s for the whole church. Many people in the parish felt that the young man would become a priest. They are all proud of him. His acceptance of a call in today’s counter-cultural world let’s people say that if he’s willing to do it with all the crises and the world’s attitudes to the Church then there’s something real and tangible to the life they’ve chosen. 3rd segment: Scot said both recent Holy Fathers have frequently written about the need for the Church to be present in new media, especially priests. Fr. Jay has long embraced this as part of his ministry. Fr. Jay originally got into web design back in 1995. He knew that the Internet was the future. One of the first websites he built was for the Diocese of Providence and his parish at the time. They wanted to do a radio talk show, but the technology wasn’t there. But later he learned about podcasting and had to learn how to do it. He knew that if we want to reach the people we have to go out where they are. If he could do online TV or radio, it would be another opportunity to reach. When he hard Fr. Roderick Vonhögen, he knew it could be done. He started his podcast in September 2005. He know has 228 episodes of iPadre. Sometimes it’s difficult to do with all that a pastor has to do, but he feels the Holy Spirit calling him. A podcast records a radio show and puts it online. They can then subscribe to it and download it to their computer or an iPhone. His theme is “Catholic life and then some.” He integrates all of his interests in life. He brings in every aspect of his life, including soundseeing tours of places he visits. The listener can’t see what Fr. Jay is seeing, but Fr. Jay describes it and the listener can use their imagination. He recalls Fr. Roderick’s soundseeing tours in St. Peter’s Square when Pope John Paul was dying and you’re crying along with them as they speak. Recently, Fr. Jay has been doing episodes on the upcoming new translation of the Roman Missal that’s going into effect this coming Advent. He talks about why there’s a new translation, that there’s nothing to be afraid of. His podcast can reach anyone in the world who has an Internet connection. He streams all of his Masses from the parish (like a live TV broadcast over the Internet), and he had been wondering if anyone was watching. Then he got an email from a disabled man in Saskatchewan who said it was the only Mass he could get. If you go to iPadre.TV, the camera is on live 24/7 showing the adoration chapel and altar of the church. He knows people who do holy hours in front of the computer. Scot asked how he would compare ministering to people in front of him, who he can see and touch, from ministering to people online. You can’t get to know people as close as you can in a parish, but there is a community online. There is a need for it not just to be an online community. He was contacted by a lawyer in Texas who traveled to Rhode Island to learn how to podcast about his profession and his faith. They had built a friendship online. Fr. Jay is a member of the Star Quest Production Network (SQPN). They all went to a conference in California and even though he hadn’t met them before, they knew each other in a way. Scot said there aren’t many priests who have embraced this kind of ministry because they are not familiar with the technology. He said their call is to preach the Gospel everywhere. It’s an opportunity for priests. He knows some priests who aren’t comfortable with technology, but it’s important not to be frightened by it. He thinks it’s important for every pastor to find someone in the parish to help them. Fr. Mark said at a recent gathering of priests, everyone had the breviary on their iPhone or iPad. No one had a book. Fr. Jay said every parish should have a website that is dynamic and updated; that has Mass times; that introduces the pastor. Then you can get help to start a Twitter or Facebook profile. He’s had people come to his parish because of his podcast. He’s also heard people say they’ve returned to confession or Mass or to have their marriages validated or even to convert to the faith. He knows his ministry isn’t just in Tiverton. Pope Benedict knows this too, that priests can touch many souls in many places. On Tuesday, Pope Benedict tweeted using an iPad at the Vatican. Cardinal Sean has a blog and uses a Kindle and just got an iPhone. Scot said Cardinal Sean isn’t a technology geek, but appreciates it as age 67. So even a priest in his 50s can do the same, to embrace websites, to build community online. Fr. Jay is inspired by the Cardinal’s blog because it shows he’s crossed the border of what’s safe. Other bishops have been inspired it. He was the first cardinal to have a blog. The name iPadre.net wasn’t difficult to get but he thought about it a lot. As a Mac fan, he liked the connection with iPod. Scot said it’s really two different Gospels: the first part is about praise, the second is about how we are invited to come to Jesus. Fr. Jay said it is a call to intimacy. God wants us to know him, not to be distant friends. St. Therese of Lisieux had that intimacy, was a down-to-earth simple friend who knew the Lord. Also, it’s about laying down the burdens we all have, to come to Him to be refreshed. Fr. Mark said the first part of the Gospel, where God reveals this to little ones, we know we are to be like children. Sometimes we over-think religion. It’s not astrophysics. Fr. Soper, who was on a few weeks ago, said a scientist can think about the origins of the universe, but he can’t ask why. A scientists can get so stuck on science, that he can’t know what children know about God. Scot asked why Jesus is praising His Father for hiding these things? First, he wants us to be humble, like St. Therese, to be simple, straightforward, trusting and obedient. He doesn’t want us to be arrogant, to be know-it-alls. He exalts those who are humble as the way to know theFather. Fr. Jay said a friend tells him, “No brains, no blockages.” He said priests sometimes are so educated that they let it get in the way of their relationship with the Lord. Fr. Mark said he once preached on the yoke in the Gospel. He said, “It may be light, but it’s still a yoke.” Religion is not pill that makes you happy. At the end of the Mass, a couple told him that he ruined their favorite Gospel. The subtlety of the yoke is what’s important. Scot said we should have a simple faith and then secondly, Jesus qualifies the invitation: All who labor. He wants us to work at life and to work at our faith. He’s not saying come to Him and there won’t be any burden, but that He’ll provide the rest. At some point, Jesus carries the weight with us. In the spiritual life, Jesus helps carry our yoke, but at some point in faith development, we grow by carrying some of His yoke, the cross, by embracing the cross. Fr. Jay said sometimes we carry the yoke of someone we know who is suffering. Fr. Mark said classically understood, a good yoke fits the particular beast, which Jesus would know as a carpenter. So our yoke is something we can carry with Jesus. Scot asked what rest Jesus is talking about. Fr. Jay said it’s a spiritual rest. Peace is not a lack of conflict, but being one with the Lord. Fr. Mark agreed. It’s not just the rest of eternal life. There’s a peacefulness of knowing God’s will. Fr. Mark has a peacefulness in his 10 years of ministry, even with the difficult times, because he knows it’s what God wants him to do. Fr. Jay said that while in this life we all have a cross, Jesus says His yoke is easy and the burden is light. Maybe if we had a bigger cross, we couldn’t bear it. But we don’t carry our cross alone. Scot said the more we love like Jesus, the more we become humble of heart. The more we know about God the lighter the burden.